The U.S. government estimated that the cost from wind damage alone from Irene - which made its first U.S. landfall as a hurricane Saturday morning in North Carolina before slamming into New Jersey on Sunday morning - is expected to top $1 billion. Wind damage isn't the only problem. Flooding is expected to get worse Monday morning in the area of Vermont's capital, where water could rise as high as 20 feet - above the 17.5 feet that led to substantial flooding in May in Montpelier. Flood warnings and watches were in effect Sunday night for much of the Northeast, and people in parts of North Carolina are dealing with homes left awash by storm surges and overflowing rivers. Floodwaters surrounds a home as storm surge from Irene hits Kill Devil Hills, North Carolina. 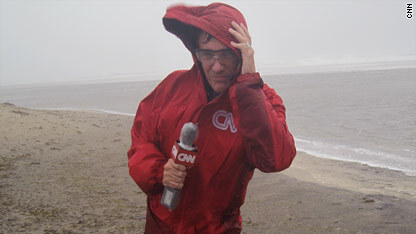 Editor's Note: CNN has reporters up and down the East Coast to cover Hurricane Irene. We'll be providing updates throughout the day on the scenes they are coming across and the people they talk to. (Kill Devil Hills, North Carolina) What a difference a day makes. 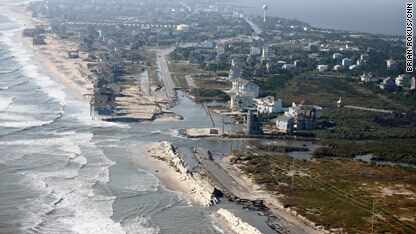 CNN's David Mattingly reported Saturday from Kitty Hawk, North Carolina,a couple miles northeast of Kill Devil Hills. Yesterday, sand and rain were blowing so hard on the Outer Banks of North Carolina that it made my skin burn. Today, I run a big risk of a SUN burn. I've always seen this as an irony of nature - the day after a hurricane is almost always beautiful, with clear skies and gentle breezes. It is a sharp contrast to the damage that has been left behind and the daunting tasks of clean-up and repair. (Avon, North Carolina) The following pictures, which I took while aboard a U.S. Coast Guard helicopter this morning with Rear Admiral William Lee, show flooding and road damage along the Outer Banks of North Carolina - including breaks in state Highway 12, which has stranded people on Hatteras Island. The storm broke parts of North Carolina's Highway 12 on Hatteras Island, photos taken Sunday morning show. 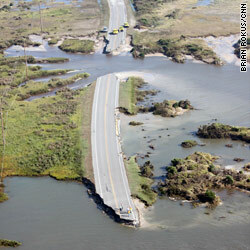 The breaks, north of Rodanthe, have effectively cut off Hatteras Island from the mainland, Lee told CNN on Sunday. About 2,500 people were stranded Sunday on Hatteras Island, Dare County officials said. About 2,500 people were stranded Sunday on North Carolina's Hatteras Island because of breaks in Highway 12, Dare County officials said. An emergency ferry Monday will provide assistance to people on the island, who chose to ride out the storm there despite mandatory evacuation orders, officials said. We were in the helicopter for five hours, departing Charlotte, North Carolina, at 6:30 a.m. We traveled along the coast from the Outer Banks to Port Smith, Virginia. The most serious damage was in the Outer Banks, including Hatteras Island, and in and around North Carolina's Dare County. (Washington) As the last bands of Hurricane Irene passed over Washington on Sunday, residents re-emerged on the streets, ready to return to their daily lives. The Dupont Circle farmers market in Washington was open Sunday. Farmers markets in Georgetown, Eastern Market and Dupont Circle opened as planned with a few less vendors. Standing among her farm-ripe peaches, apples and nectarines, Emily Zaas said she knew on Saturday night that she would be selling on Sunday in Dupont Circle. “Today we have white peaches, white nectarines… three kinds of sweet plums and six kinds of apples and not bringing them is just not an option,” said Zaas. And there were plenty of people buying. Through light showers, Chloe Holderness and her family perused the brightly colored produce. Holderness’ said her daughter was “antsy” and wanted to be outside, rain or shine. CNN found Abdel Basset al-Megrahi under the care of his family in his palatial Tripoli villa Sunday. Lockerbie bomber Abdel Basset al-Megrahi is comatose, near death and likely to take secrets of the attack on Pan Am Flight 103 to his grave. 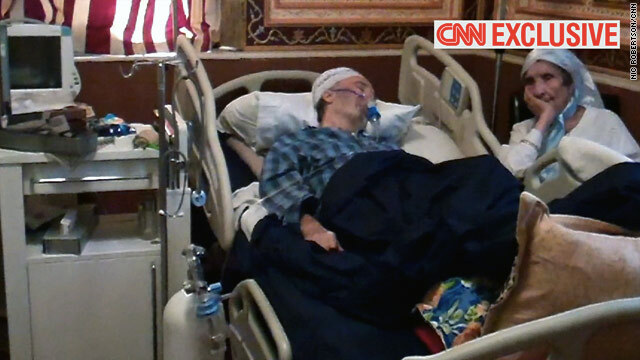 CNN found al-Megrahi under the care of his family in his palatial Tripoli villa Sunday, surviving on oxygen and an intravenous drip. The cancer-stricken former Libyan intelligence officer may be the last man alive who knows precisely who in the Libya government authorized the bombing, which killed 270 people. "We just give him oxygen. Nobody gives us any advice," his son, Khaled al-Megrahi, told CNN. Abdel Basset Al-Megrahi was freed from a prison in Scotland in 2009 after serving eight years of a life sentence for blowing up the Pan Am jet, killing all 259 on board and 11 in the town of Lockerbie below. Doctors who had been treating him for prostate cancer gave him just three months to live, and he was released on compassionate grounds. Flooding emerged as a major concern Sunday for states hit by Irene, which hit the East Coast as a hurricane and then a tropical storm over three days. Even as Irene weakened to a tropical storm, authorities warned that its impact was not waning, especially in Vermont. "Many Americans are still at serious risk of power outages and flooding, which could get worse in coming days as rivers swell past their banks," President Barack Obama said Sunday, adding: "The recovery effort will last for weeks or longer." Officials said the storm had knocked out power to more than 4 million people and was responsible for at least 20 deaths. [Update 11:11 p.m. Sunday] Emergency officials said at least 20 people across the United States have died as a result of Hurricane Irene . [Update 11:09 p.m. Sunday] The body of woman who apparently drowned after either falling or being swept into a storm swollen creek was recovered Sunday near New Scotland, New York State Police said. The woman's body was pulled from Onesquethaw Creek about 4:30 p.m., police said. The identity of the woman was not immediately released, though police said that a New Scotland man reported his wife missing about noon. She was last seen near the creek. [Update 11:08 p.m. Sunday] Irene ceased being a tropical storm late Sunday as it swirled near the U.S.-Canadian border, the National Hurricane Center reported. Despite losing its tropical characteristics, the storm continued to kick out sustained winds of 50 mph about 50 miles north of Berlin, New Hampshire. [Update 8:41 p.m. Sunday] More details about flooding concerns in Vermont's capital, Montpelier: Jill Remick, from the state's emergency management division, said water in the area - where multiple rivers converge - could rise as high as 20 feet, above the 17.5 feet that led to substantial flooding in May in Montpelier. 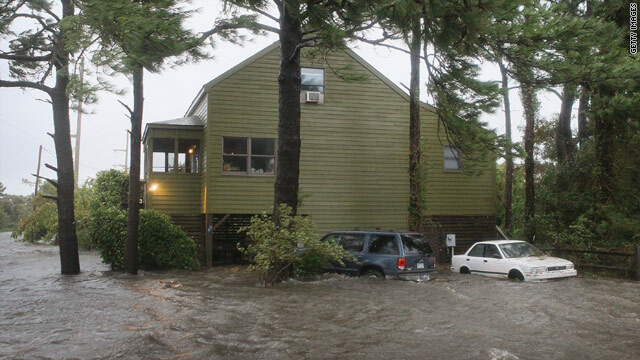 See how other states are faring in this state-by-state list of Irene developments. [Update 8:30 p.m. Sunday] New Jersey Gov. Chris Christie says he erroneously reported that a firefighter died during an attempted water rescue in Princeton. He said he was provided erroneous information and apologized, saying the firefighter was in intensive care. This lowers a count of U.S. deaths reported to be linked to Irene to at least 18 in seven states.